Nestled on the campus of the University of South Dakota, in Vermillion, near the spot where the Lewis and Clark Expedition camped in 1804 and overlooking the Missouri River, is The National Music Museum. 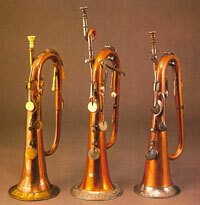 It is a Mecca of musical instruments including a large selection of brass and copper pieces. The National Music Museum and Center for Study of the History of Musical Instruments was founded in 1973 and is one of the greatest institutions of its kind. Today, the museum continues to attract visitors from around the world according to Dr. Andre Larson, Director of the NMM. "We only have 4% of the more than 14,500 instruments in the actual museum online," says Dr. Larson, noting that his father, a collector, had 2500 instruments. "When it came time to decide what to do with these instruments we brought them to the University of South Dakota and put them into the former Carnegie Library Building with other items. Over a period of time the other objects were moved elsewhere, so it was formalized as a National Music Museum." According to Dr. Larson, one of the major collections acquired was the Witten Rawlins collection of early Italian string instruments, which really put the museum on the map. However, their brass, copper and other alloy instruments are phenomenal, especially the three-keyed bugles (NMM#2376, 446 and 860). "Those three-keyed bugles contain brass, copper and a mix of the two," Larson explains. "The keys, on the side of the brass tube, were created before valves were invented as an attempt to play all scale notes on a brass instrument. You couldn't go up a scale or play all the notes on a bugle, therefore, most of the intervals have wider jumps. Of course, now we do that with valves. You'd open those brass keys on saxophones or woodwind instruments to provide the musician with many notes." Many items are on display, continuing the legacy of these artfully crafted instruments. The upright serpent tops an instrument that looks like a bassoon with a bell stuck at the end of it, and made to appear like a dragon's head - with copper or brass embellishments. It's also known as a Russian Bassoon and was made by Sautermeister and Muller, Lyon France, (circa 1828). The piece was gifted to the museum in 1981 by Frederic and Elisabeth Burt, from Michigan. "Those were primarily made for military bands, hence the dragon's head or something ferocious," says Larson. "We have thousands of brass instruments---cornets, trombones, sousaphones, tenor trombones, and others too numerous to mention. Sometimes they're made out of brass or other alloys, and many are created from copper. In fact, the early ones were primarily copper because it's an easy metal to work." His exquisite instruments gleam with gold and brass, with elaborately decorated Slide Stays and Bell Bows, garnished with delicate floral and foliate designs. Even the brass slides have engraving and impressed rings used alternatively with embossed gold. "We have 14,500 instruments from the 16th century to the present, virtually representing every country in the world," continues Larson. "Of those, approximately 1200 are on public view at one time. We also have audio visual guides, and when visitors arrive they see the outside and inside of the instrument."